There’s a race to bring new migraine treatments to the 38 million Americans who have them. On Tuesday, Botox-maker Allergan said that its version of the medication succeeded in a late-stage trial. Allergan plans to submit the drug for approval in 2019. The new drugs are used to either prevent migraines or alleviate them when they happen. A wave of new migraine medications are getting closer to approval. The migraine market is huge. An estimated 38 million Americans have migraines, a chronic neurologic condition that can cause pain, sensitivity to light and noise, dizziness, and nausea. For some, more than four days of the month are consumed by the episodes. On Tuesday, Allergan said that said that its preventative medication succeeded in a late-stage trial for its oral treatment that’s meant to work when patients have a migraine attack. A greater percentage of those who received the treatment were pain-free after two hours, compared to those who received the placebo. Allergan plans to submit the drug for approval in 2019. While there aren’t any drugs available today that were originally approved to alleviate migraines, other treatments – including Botox and anti-seizure medications – are used. Pain relievers can also help treat some of the symptoms of migraines. Allergan’s drug is part of a new class of medications that target CGRP, short for calcitonin gene-related peptide. CGRP isn’t exactly a new target. 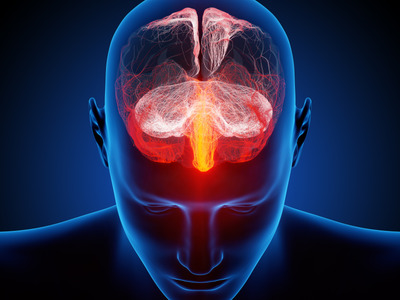 CGRP has been known to play a significant role in migraines since the 1980s and 1990s, though it’s taken some time to develop the technology that can leverage it. A large portion – roughly 15 million – would be eligible for preventive treatment. Right now, three of these preventive drugs could be in front of the FDA for review. Here’s the skinny on each of them. Amgen, erenumab– Amgen filed erenumab with the FDA in May. In data released in June, Amgen said its drug was able to reduce the number of migraine days per month by 6.6 days in patients who received the treatment, compared to a 4.2-day reduction in the placebo group. Before the trial, patients had about 18 migraine days. Lilly, galcanezumab – Lilly presented phase 3 data in June. The company found in two studies that patients on the drug had between a 3.6 and 4-day reduction in migraine days per month (to be eligible, patients had to have between 4 and 14 migraine days per month). That’s compared to the 2.15 and 1.85 day reduction that was observed in the placebo groups. Lilly filed galcanezumab with the FDA in December. Teva, fremanezumab– On June 7, the company came out with data from its late-stage trial. On average, the trial participants had 9.1 migraine days. Those who got the medication had on average 3.7 fewer migraine days per month, compared to 2.2-day reduction in the placebo group. Teva filed with the FDA in October. Alder Biopharmaceuticals, eptinezumab– Alder’s drug, which would be administered on a quarterly basis, succeeded in phase 3 trials, the company said in January. The company plans to submit to the FDA in the second half of 2018. The new class of drugs aims to reduce the number of days per month people have migraines. With the exception of Allergan’s oral version, the drugs are injected typically on a monthly basis. If approved, the drugs are expected to cost $US8,500 per year.